I posted a while back about how I'm GROWING MY HAIR OUT after donating it to wigs4kids.org. 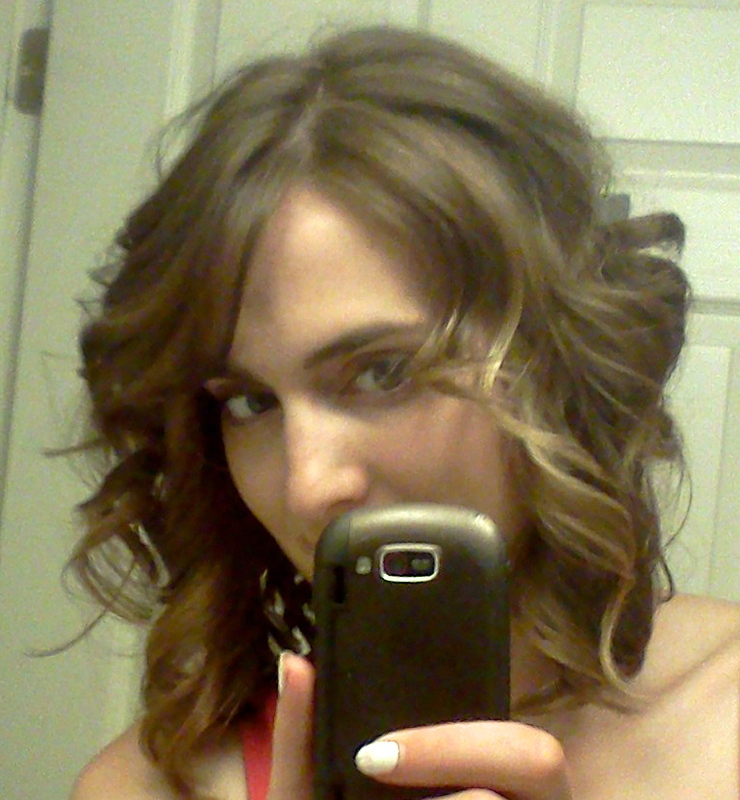 I went from having mid-back length hair to a *super* short cut, which I liked but I missed being able to put my hair up. I'll probably go back to the bob some day, but not yet! 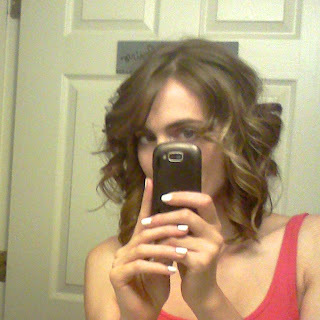 So I've been trying to grow my hair out since November 2011. Yes. Nine months- and my hair is just now touching my shoulders, and even then it has to stretch to make it. It's such a long process and my hair has gone through a lot of awkward stages during my cut-free season. In my post about growing out hair, though, I mentioned that it may be a good idea to get *one* shaping cut during the process to help with the awkwardness and that's what I did last night! A couple of my friends recommended a wonderful stylist named Elise as the perfect person to take care of my hair issues and I'm so glad they did! Elise was wonderful and totally got my hair goals (#firstworldproblems). She didn't really take off any length and just cut in some layers/shape so that my hair can fall nicely and not be so triangular and terrifying when down. It was really exciting because I've never been a hi-lighter of hair. She gave me some subtle balayage so that as my hair grows out there will be an ombre effect. 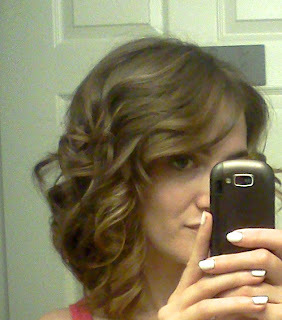 For those of you who were on FACEBOOK for my DIY balayage attempt- this was a much better idea than what I did. Oh my word. 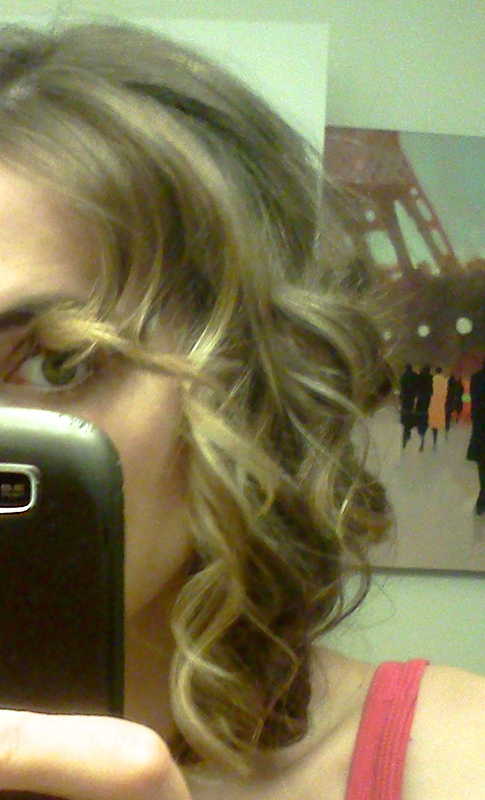 So anyway- that's my new hair for the first time in a *long time* and it turned out really well. AND- Elise is awesome. Not only is she a stylist, but she's also an incredible interior designer. We've already started planning my next visit to her home which I'll be photographing for you all to glean from. It's amazing. The minute I walked into her home my jaw dropped. Just so gorgeous and put together. Wow. And she's currently getting ready to re-do her daughter's room since a "big girl" bed arrived for her yesterday, so that will prove to be fun as well! Elise- you are the best! Next up- I was making friendship bracelets with 2 of my favorite girls the other day and one of them asked me to make her this accessory for her hair. I don't know what to call it- so for now I'm calling it colored strands? Any ideas/suggestions? I thought I'd share it with you because it looked so cute in her hair. All we did was put some embroidery floss through the end of a bobbie pin, stop in the middle and tie the center of the bobbie pin in place and then knot it holding both ends in the same hand, making a loop and pulling them through. Done. Easy. We did a bunch using bobbie pins but you could also use hair clips. Another idea would be to knot it on the end of your bobby pin and then create a friendship bracelet knot on it to wear in your hair. Cut off the extra floss when you're done. If you've never made a friendship bracelet- here's the basic knotting pattern- I used "bunnies and trees" to explain it to the girls and it worked- so let's stick with that analogy. 1) Knot the ends with about 1 inch of extra floss at the end. 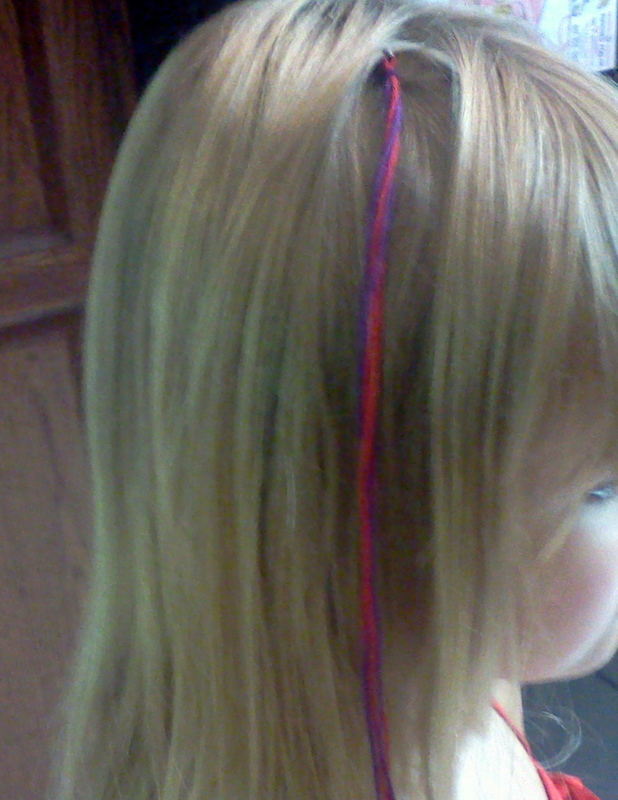 I use 3 strands of 2 different colors, more strands will make it thicker and less will make it thinner. The strands should be about 18 inches. I use my knees to hold it in place, but you can use tape on a table, too. 2) Cream starts as the bunny and goes *in front* of the black tree. then her tail loops around through the circle. Pull tight. 3) Black is now the bunny and loops around *in front* of the cream tree, puts her tail through the loop and pulls tight. Continue alternating til you run out or the bracelet is long enough and then knot the end. You can also make the same color the bunny + the same color the tree for the entire knotting process but the only color that you will see is the bunny color. Also it will create a little spiral circle running along the entire bracelet. So there's a short little Saturday edition. I am so excited about Monday's post that I almost want to put it up now. I haven't done a refashion in SO long and this is crazy easy. If you own a pair of scissors, you can do it! So get ready. I hope your weekend is going well- all the best and as always, thanks for reading!